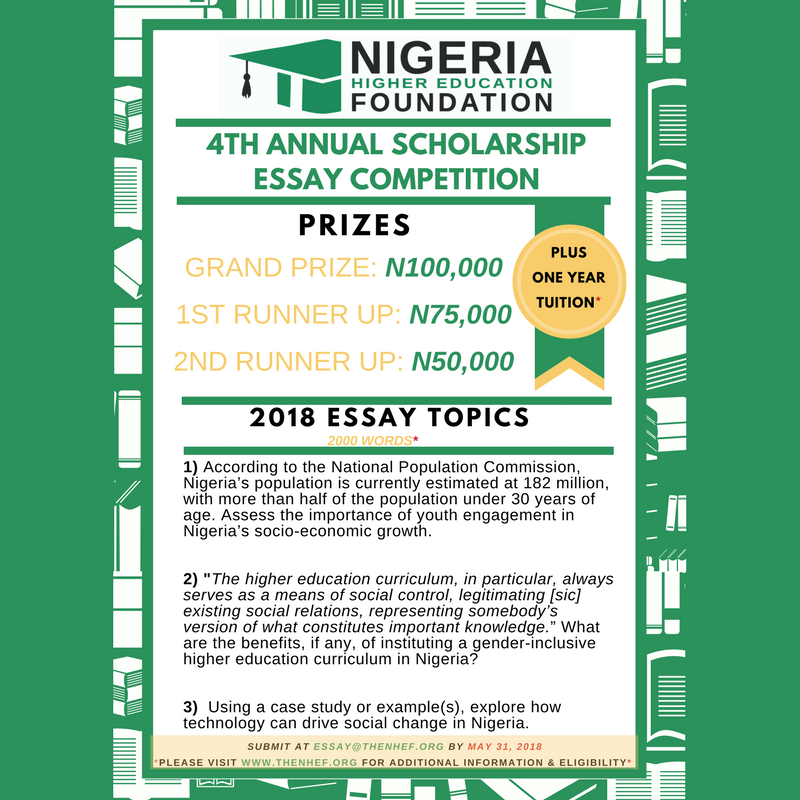 The Nigeria Higher Education Foundation (NHEF) is pleased to announce the 4th Annual Scholarship Essay Competition. We are challenging students to think critically and strategically about change and how they can effect change in Nigeria. The 2018 Essay Topics are themed around Technology, Youth Engagement, Gender, and Socio-Economic Growth. 1) According to the National Population Commission, Nigeria’s population is currently estimated at 182 million, with more than half of the population under 30 years of age. Assess the importance of youth engagement in Nigeria’s socio-economic growth. 2) “The higher education curriculum, in particular, always serves as a means of social control, legitimating [sic] existing social relations, representing somebody’s version of what constitutes important knowledge.” What are the benefits, if any, of instituting a gender-inclusive higher education curriculum in Nigeria? 3) Using a case study or example(s), explore how technology can drive social change in Nigeria. NHEF Partner Universities include Ahmadu Bello University, Bayero University (Kano), University of Ibadan, University of Lagos, University of Nigeria (Nsukka), and University of Port Harcourt. Students enrolled in their penultimate year are third-year undergraduates of a 4-year degree program or fourth-year undergraduates of a 5-year degree program. NHEF will verify enrollment of each contestant with the University Registrar. Grand Prize winner of the 2018 Essay Competition will be awarded a cash prize of N100,000 with a year of paid tuition. The First Runner-up will be awarded a cash prize of N75,000 with a year of paid tuition. The Second Runner-up will be awarded N50,000 with a year of paid tuition. All entries must be submitted via e-mail to essay@thenhef.org by 11:59 p.m. (WAT) on May 31, 2018. Students are encouraged to study rules on how to avoid plagiarism, as the essays will be checked for intellectual authenticity. **This link contains a helpful guide. Scholarship and Award prizes will be permanently lost if the student: Does not attend an eligible NHEF Partner University; Winners will be announced via media channels (NHEF Facebook account, NHEF Instagram account, NHEF Twitter account, and NHEF Website); Winners will be contacted via communication method provided during application submission; The NHEF will make reasonable attempts to contact winners following announcements via media channels; Failure to claim prizes within 30 DAYS of announcement date, will automatically forfeit winnings; The student is found to have provided false or misleading information in claiming the award; The student fails to provide documentation to clarify an error or contradiction regarding his or her claim information that is discovered after the being selected; Unsatisfactory academic standing /Academic Probation will result in immediate forfeiture.